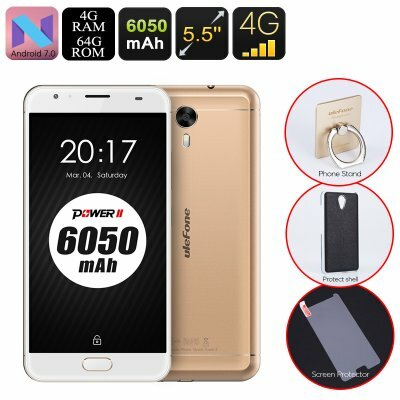 Successfully Added HK Warehouse Android Phone Ulefone Power 2 - Octa-Core CPU, 4GB RAM, 6050mAh, 1080p, 2 IMEI, 4G, 13MP Cam (Gold) to your Shopping Cart. The Ulefone Power 2 is a powerful Android phone that lets you enjoy the most demanding software without dropping a frame. Running on the latest Android operating system, this Android 7.0 smartphone truly brings along a smooth performance that comes packed with the best features the mobile phone industry has to offer. On its stunning 5.5-inch Full-HD display, it allows you to play games, watch movies, and make use of Android applications. For those of you that are looking for an Android phone that brings along a lag-free and powerful media experience – the Ulefone Power 2 certainly is a mobile phone to consider. Along with this top-notch software, this Android phone furthermore packs state-of-the-art hardware that includes an Octa-Core CPU and 4GB of RAM. With all this power at your disposal, you’ll be able to enjoy the latest and most demanding media without ever needing to worry about slowing down your device. An epic 6050mAh battery is in place to deliver an unbelievable 63 hours of continuous usage time and 75 days of standby time. This lets you take the most out of your Android phone for numerous days in a row without ever needing to worry a second about its battery life. When empty, the phone can be easily charged in less than 2 hours thanks to Quick-Charge technology. Featuring Dual-SIM card slots and two IMEI numbers, this mobile phone brings along great connectivity. If you are searching for an Android phone that lets you be reachable on two phone number simultaneously, then the Ulefone Power 2 is perfect for you. Additionally, it supports 4G connectivity through which it lets you browse the web and download files at lightning speeds. No matter where your next trip will take you, with this Android smartphone you’ll always stay connected. At the rear of this beautiful Android mobile phone, you’ll find a stunning 13MP camera that lets you enjoy high-end photography through your handset. Capable of snapping breathtaking images and footage at any time of the day – this Android phone certainly takes smartphone photography to the next level. It furthermore comes with a sophisticated 8MP front snapper that is perfect for taking selfies or engaging in online video calls. With 64GB of internal storage and the added option to slide in a 256GB SD card slot, this mobile phone offers plenty of space to store your pictures, videos, and all other media.